Good morning everyone!! I hope you all had an amazing weekend! It snowed like crazy all weekend so J and I just cozied up and watched movies all weekend with friends. We left the house once to go to the gym and then we ate all the calories we had just burned off by eating burgers at Lucky 13. Such an amazing burger place, if you crave blue cheese the way I do than you will love the stinky cheese burger yum! Also, make sure to add bacon to any burger because their’s is out of this world!!! I love the outdoors, I feel so free, there really is no other place I’d rather be than exploring the outdoors. The scenery was so beautiful up at our cabin. It is lakeside so there are some of the most beautiful views! The blue iced lake and snowy fields were just mesmerizing, I wasn’t planning to do an outfit shoot here, but the scenery was to gorgeous not to!!! I only brought one outfit with me and wore it on repeat, we were only there two days haha so this is the only one I could shoot with. It worked out great though, because this sweater is gorgeous and my number one go to when its freezing and I am in need of something cozy! Below I have listed a few other blanket sweaters. Hope you enjoy!! Love you all! It looks like you had such a fun weekend, Jenessa! I am loving that blanket. I love the layering of your outfit here. You look super stunning and the sunglasses add pizzazz to the whole outfit. I love how deep the snow looks thus more fun for you!! thank you doll! haha you have no idea it was sooo deep, such an adventure! I just love these photos! That sweater layered with your blanket is gorgeous! I’m so obsessed with your sunnies! You look gorgeous and the location of these photos is breathtaking!!! thank you rachel!! you are the sweetest! Looks cold, but looks like a ton of fun also! I love Utah! Such a pretty place. it was freezing but so worth it, its gorgeous!! Those sunglasses are so cool! Stunning photos! Those sunglasses are so amazing! And you look absolutely gorgeous in these pictures!! thanks so much! you are the sweetest! Very pretty! You got amazing shots too my dear. You making me wanna visit Utah. I’ve only been to the airport for the layover but the mounains from above looks so good. Thank you doll!! Yes you really do need to visit the mountains are so breathtaking here! what a fun adventure! love those sunglasses! Such beautiful pictures!! Looks like a fun time! Your photos are absolutely spectacular girl. Love your blog so! oh yay! you just made my day!! thank you so much!! You look absolutely gorgeous! Love this layered look! These pictures are beautiful! I love how you’ve layered your blanket with your sweater, it’s a great combo. Super look! Thank you Jackie!! I love this blanket, it is pretty much the same material as my sweater LOL so i was super warm! These photos are beautiful!! And can I have your sweater?! They’re perfect! haha right!! I am obsessed with this sweater! Jenessa, this is such a beautiful post! 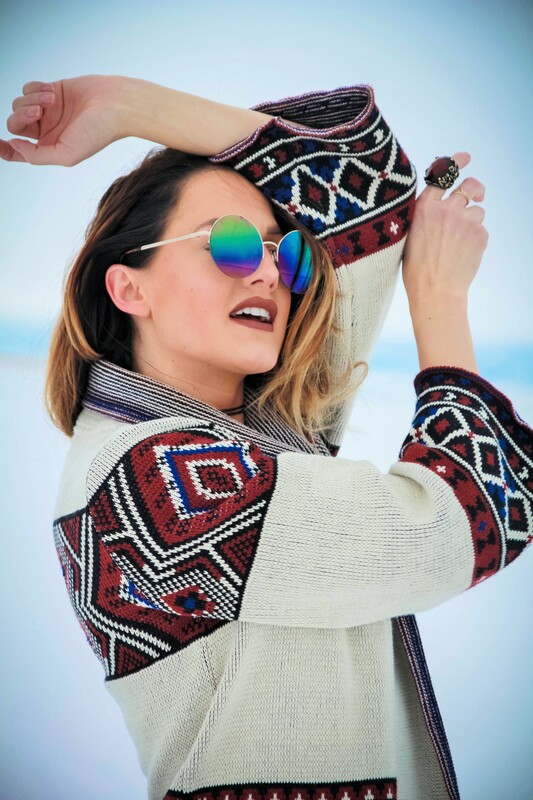 Love the cozy sweater and those sunnies are so hot! You are a vision in the snow! Thanks Vanessa! hope you are having a wonderful time in Paris! Wow! What a fantastic colors in this post. I’m in love with your colorful sweater.I really like your style and your blog too. Thank you so much doll!! I am happy you like it! cant wait to visit yours!